The M-223 3-12x42 with side focus parallax adjustment lays down a serious power range for your most extreme shooting. Implements the new Rapid Action Turret technology to position the Nikoplex reticle on-target at virtually any yardage up to 600 yards. This incredible new system, based on a .223/5.56mm 55-grain polymer tipped bullet, simply and effectively allows you to dial in your elevation anywhere from 100 to 600 yards away in less than one revolution! Now you can stay in the middle of your Nikoplex crosshair at virtually any shooting distance with a quick turn of the turret. Just sight in at 100 yards as usual, then lift the adjustment knob, rotate to your “zero”, and re-engage. Field adjustments are now as simple as dialing-in your subsequent ranges. 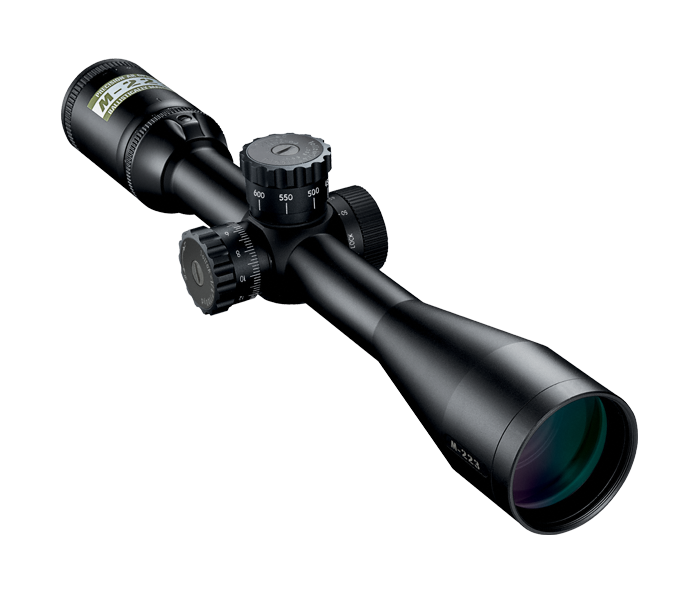 The high magnification range zoom makes it the ideal optic for heavy barrel AR15 platforms. Includes removable ARD objective lens glare eliminator.